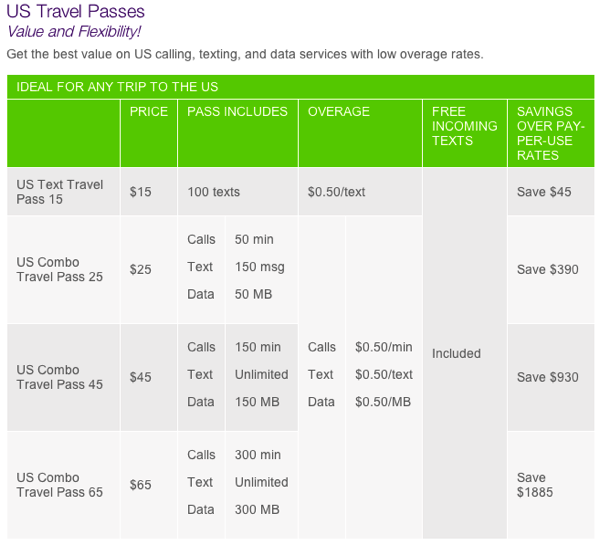 For example, with TELUS’ previous US combo travel pass customers would pay $100 for 150 airtime minutes, unlimited SMS, 100 MB. Now customers pay only $45 for the same package – a savings of $55. We also have a new pass that gives you 50 minutes, 150 texts and 50 MBs for $25, one that gives you 300 minutes, unlimited texts and 300 MBs for $65. These are all for 30 days. We are always looking for opportunities to reduce rates further and offer customers even more value. We work with hundreds of carriers around the world to negotiate the best possible rates for our customers. Those efforts have been successful, allowing us to reduce our roaming rates by more than 60 per cent since 2011. Earlier today we saw Rogers announce an LTE roaming partnership with AT&T in the USA, which is applicable to their $7.99/day roaming plan which includes 50MB. When pressed about how TELUS rates compare to the Rogers $7.99/50MB plan, the company explained their $5/MB plans are prorated based on actual usage. An example provided was if you only use 100kb for some emails, you only pay $0.50 whereas with Rogers, you’d pay the full $7.99 regardless of how little you use. Unlocked iPhone owners have different options for roaming in the USA. You can pop in a local SIM card from T-Mobile or even have your plan setup locally before you leave using Vancouver-based Roam Mobility.